'Wickham' was the name given to their villages by the very earliest English settlers in what would become known as East Anglia, and thus it can be assumed that villages with the word as part of their name are among the longest continually occupied settlements in England. 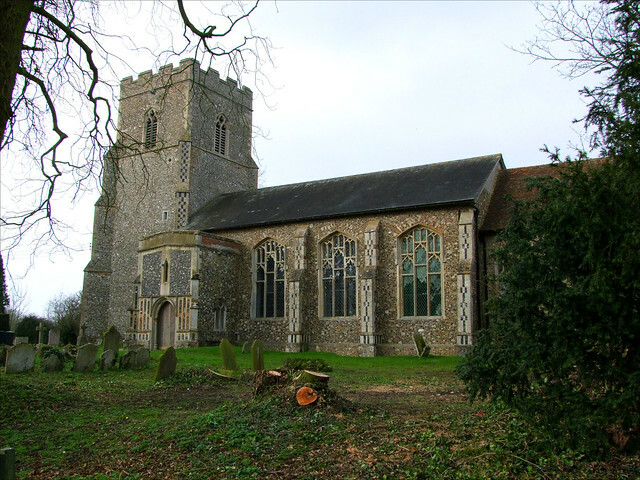 Suffolk has three such villages, but whatever was on the site of this church before, and there must have been a church of some kind here since at least the 7th Century, local money enabled a massive rebuilding in the 14th and 15th Centuries. The church sits at the heart of the village, but is hidden: a little lane winds off of the village high street, taking you up towards the west end. The tower and west doorway make a fine sight as you approach. To the north of the church is a magnificent yew tree. Most unusually for this part of Suffolk, the church is kept locked. There is a keyholder, but I had been several times before and not found them in, so it was not until the early spring of 2011 that I saw inside for the first time. And I must be honest and say that the best thing about this church is its exterior, with two fine porches and grand Perpendicular windows. I stepped into a building which was largely Victorianised inside, although there are plenty of earlier survivals and some idiosyncracies. The font is contemporary with the rebuilding, its tracery-patterned panels in good condition, although the shaft has taken a beating. Above it rises a good west gallery. The seating in the nave is a mixture of all ages, presumably most of it locally made. There is no 19th Century stained glass, and with the huge windows it was as light in the nave as the day was outside. The south side of the nave is a good setting for an etched window of 1998 depicting the Summons in the palest of colours, with the instruments of the Passion and the symbols of St Peter at the heads. On a bright day it must all but disappear. 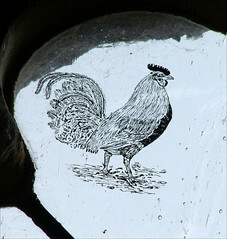 It is signed Walter Wilson hoc sculpsit ('Walter Wilson etched this'). The three image niches to the north of the chancel arch are unusual, but the off-the-peg 19th Century stone reredos can be found in hundreds of churches great and small, all around the former British Empire. However, note that the altar rails which hem it in with their deliciously lathed balusters are late Stuart, probably soon after the 17th Century Restoration, and thus one in the eye for the local Puritans, of whom there had been many. Finally, I always like to find locally made jam for sale in a church, and the jar I bought here proved excellent. However, with the church kept locked, and the key a fair walk away, I don't suppose that they do much passing trade.